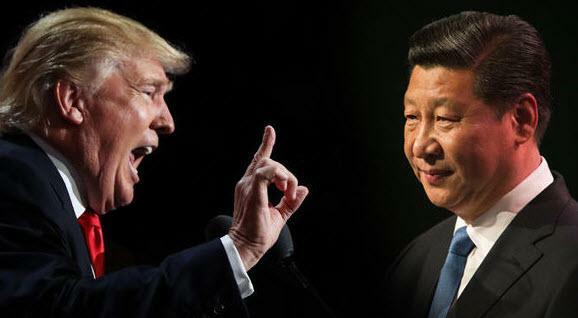 The debate over tariffs has mostly emphasized their impact on economic growth and jobs, which overlooks specific stories of suffering caused by President Donald Trump's trade war. Lincicome points out that this is a "Trump Tax" - businesses of all sizes have seen their input costs rise because of Trump's tariffs. To maintain already slim profit margins, many of these businesses have no choice but to raise prices. But not all businesses can offset tariff costs through price increases, because their customers are price sensitive and will simply take their business to a foreign competitor. These companies have been forced to take cost-cutting measures such as laying off employees or forgoing expansion. Then there are the countless farmers and exporters who have seen their markets dry up as trading partners impose retaliatory tariffs. '47 Brand Hats: The Massachusetts company, which faces higher raw material costs thanks to Trump's tariffs, cannot find domestic suppliers to produce hats. It is considering job cuts to compensate. 5th Avenue Energy: This small California renewable energy firm found that lighting fixtures and other Chinese imports are more expensive and harder to obtain because big contractors bought them up in anticipation of tariffs. A-1 Signs: The Tennessee manufacturer depends on competitively priced steel to fabricate products and compete in a global marketplace. Tariff-induced steel price spikes have forced it to lraise prices, hurting consumers and pushing them toward cheaper foreign competitors. If A-1 cannot retain its customers, it will have to lay off employees. ABB: The Missouri electrical manufacturer is considering raising prices for its transformers because of tariff costs, at the risk of being undercut by foreign competitors. Able Steel Fabricators: The Arizona manufacturer says the construction industry will come to a "screeching halt" when customers refuse to pay the higher prices that tariffs will bring or subcontractors will be forced to eat the increased costs. Accu-Swiss: The California precision-part manufacturer has been forced to turn off the lights while keeping its machines on in an attempt to absorb the cost increases caused by tariffs. Alcoa: The aluminimum-product manufacturer cut its profit forecast ranges by $500 million, citing tariffs on aluminum it imports from Canada. Alfa: The processed-food maker switched to Canadian, European, and South American suppliers to avoid tariffs. All Metals Industries: The New Hampshire metal-service center has been forced to turn down large orders from potential customers because it can't source material due to tariffs. Amber Ox Public House: The Virginia brewer has seen a rapid drop in can availability, while prices have increased. American Keg: The Pennsylvania stainless-steel beer keg manufacturer was forced to lay off 10 of its 30 employees because of tariff-induced costs. It has passed on some of the costs through higher prices, leading some customers to switch to foreign vendors. "We have a lot of patriotic customers that want to buy USA-made kegs with U.S. labor and U.S. steel," the company's CEO says, "but they're only going to go so far as that price difference continues to rise." Americana Development: The Ohio wheel maker has been forced to raise prices due to tariff costs. As a result some customers have taken their business to Chinese suppliers. Arrow Fasteners: The staple manufacturer cannot pass along tariff-related increases in input costs to customers because they would just turn to foreign competitors. "We're stuck," says the owner. AutoZone: Tariffs are forcing the auto parts chain to raise prices on components made with steel, such as rotors and other brake parts. Auvil Fruit Company: The Washington fruit company is being squeezed by its Chinese customers because of retaliatory tariffs. It's faced with a choice between sacrificing sales and dramatically reducing prices to account for the tariffs. "We lose all negotiating power or leverage in that equation," the company's CEO says, "because you can't just sit on the supply and hope they give in. Our products will rot. So we sell and try to recover as much of our upfront cost as we can, just to minimize the damages." Auvil has lost more than $2.2 million in profit. Batesville Tool & Die: The Indiana company may be forced to shift some production to a plant in Mexico in response to higher steel prices caused by tariffs. Neal Beam: Tariffs have reduced the Kansas farmer's soybean crop prices by $150 per acre. Bertram Yachts: The Florida boat maker lost a $4 million yacht sale in Europe because of retaliatory tariffs. Black Cat Wear Parts: The Iowa manufacturer has missed growth and capital equipment opportunities because of tariffs. BMW: The carmaker says tariffs could lead to "negative effects on investment and employment in the United States." Boeing: The aircraft maker's stock price cratered because of worries that tariffs will cause China to shift purchases to Airbus. Boulder International: The U.S. e-cigarette designer was forced to raise prices and shelve hiring plans due to tariffs on Chinese manufacturing. Brilliant Home Technology: The California startup was forced to boost prices on its Wi-Fi-connected "smart" light switches from $249 to $299 because of Trump's tariffs. Brinly-Hardy: The Indiana lawn care company, which has been in business since 1839 and survived the Civil War, has had to lay off 75 employees because of tariff costs. Brunswick Boat Group: The boat maker warns that tariffs could cause a drop in sales and layoffs. Ronald Burris: "The value of the crop is taking a beating," says the Indiana farmer. "There could be some trying times this fall." Bush Brothers and Company: The canned baked beans company has experienced an 8 percent decline in its revenue because of higher steel prices. CAID Industries: The Arizona industrial metal fabricator has been forced to stretch jobs from weeks to months because it takes a couple of months to find material due to tariffs. The company has had to shelve some projects. Case Medical: The medical instrument manufacturer is absorbing some of the tariff costs but cannot source enough U.S.-based supply to manufacture domestically. CaseLabs: The California PC case maker has been forced into bankruptcy and liquidation because of Trump's tariffs, which raised its costs by almost 80 per cent. Caterpillar: The tractor company faces $200 million in tariff-related costs in the second half of 2018, forcing it to raise prices. Cedar Ridge Winery: "They already have impacted our business," the winery's owner says. "When you hear about a tariff, you think we're just going to raise the price in the other country. But it's not their problem; it's our problem, especially when you're trying to start a new relationship with a new distributor in a foreign country. We ate the bulk of it. So yeah, it's definitely affecting the bottom line." Chibitronics: Tariffs have forced the New Jersey education technology manufacturer to choose between immediate price increases and cutting employee salaries. Chuck McCarthy: The North Carolina cold storage company has seen its Chinese pork customers dry up because of retaliatory tariffs. Cloud's Meats: The Missouri meat shop has seen the price of beef hides fall because of tariffs to the point where it's no longer profitable to sell them. Coca-Cola: The soft drink maker raised prices for soda and other beverages to offset tariff-induced cost increases for freight shipments and metals used in its bottling systems. Columbia Sportswear: The clothing company's mannequin costs have risen as a result of Trump's tariffs. "Not knowing week to week what the rules will be makes it difficult to invest," its COO says. Correct Craft: The Florida boat maker says its aluminum costs could rise 20 percent to 30 percent when its contracts are renegotiated this fall. Overseas sales, which make up about 30 percent of the company's revenue, are already nearly at a standstill. Council: The California design studio is experiencing difficulties related to metal sourcing because of tariffs, forcing it to move some of its fabrications abroad. Cummins: The engine and generator company faces $100 million in tariff-related costs in the second half of 2018. Daniel Paul Chairs: The furniture company struggles to enter competitive bids for hotel and office chairs without knowing what impact tariffs will have on material prices. The 25 percent tariff is higher than the profit margin on some bids. Dry Fly Distillery: The Washington company, a low-margin small business, is uncompetitive because of tariffs. Eastman Chemical: The company has put a hold on a five-year effort to sell ethylene plants in Texas because prices are falling as a result of China's retaliatory tariffs. Electrolux: The home appliance company faces $10 million in added second-half costs for imported parts. Element Electrics: The South Carolina television assembler plans to shut down and lay off nearly all of its 134 employees because of tariff costs. Emeco: The chair manufacturer faces 17 percent higher prices for aluminum because of tariffs. Engineered Materials Solutions: The Massachusetts car part manufacturer is losing millions of dollars due to Trump's tariffs and can't access the parts it needs domestically. Michelle Erickson: The Montana farmer says tariff-induced loss of markets will reduce incomes and jobs in farm communities. Fiat-Crysler: The carmaker is developing manufacturing contingency plans "on a massive scale." Flex-A-Seal: The Vermont mechanical-seal manufacturer says tariffs have raised the cost of raw materials by 30 percent in some cases. As a result, it has to raise its prices, which means losing business. Fluor: The oil and gas company gets some components for its plants from Chinese manufacturers. Its major methanol project in Louisiana could be delayed or canceled due to increased costs and uncertainty. Ford: The carmaker faces $300 million in extra costs this year due to escalating tariffs. It took a $300 million hit in the most recent quarter because of pricier commodities such as steel and aluminum, whose costs have been inflated by tariffs. Gerald Garber: "The market is geared for exports," says the Virginia farmer, who notes that the anticipation of tariff effects already has driven down milk prices, which were at a historic low. General Electric: The U.S. conglomerate, which faces $400 million a year in tariff-induced costs, is considering adjusting its supply chain to mitigate the effects. General Motors: The carmaker, which cut its earnings forecast for the year because of surging prices for steel and aluminum caused by tariffs, is considering cutting U.S. jobs. Gentex: The company, which makes rear-view mirrors for cars, cut its annual gross margin forecast, citing increased raw material costs of as much as $8 million in the second half due to Trump's tariffs. Grandall Industries: The Ohio construction equipment maker has had to postpone expansion plans, including 30 new employees, because of tariff costs. Green Acres Farm: "It's desperate out there in the dairy industry right now," says the owner of the Delaware dairy farm. Green Alternatives: The bottom line of the Indiana solar-panel installation company has been hurt by solar, steel, and aluminum tariffs. As a result, it is looking at layoffs and has abandoned plans to make capital investments. Green Valley Pecan Company: The Arizona farm says reduced Chinese consumption will increase pecan supply and reduce farm prices. Hallmark Homes: The Indiana homebuilder reports that lumber tariffs have had a big impact on pricing of new residential construction. Prices have risen about 20 percent, which could contribute to a broader housing-market slowdown. Harley-Davidson: The motorcycle manufacturer cut its profit margin forecast for the year due to tariffs, which are forcing it to move some production overseas. Harold Force: The construction company faces rising prices on items needed for contracts signed in less expensive, pre-tariff times. One of its biggest projects was canceled because of tariff-induced steel price hikes. "It's damaging in so many ways," says the owner. "Tariffs have put blood in the water." John Heisdorffer: "Soybeans are the top agriculture export for the United States, and China is the top market for purchasing those exports," the Iowa farmer says. "The math is simple. You tax soybean exports at 25 percent, and you have serious damage to U.S. farmers." Herman Miller: The Michigan furniture maker has seen dramatic price increases, making current domestic prices equivalent to import prices after tariffs. Hexcel: The aerospace materials supplier expects a tariff impact of $2 million to $3 million a year related to imports from China. HiberSense: The Pittsburgh-based HVAC manufacturer was forced to shift focus from building the company to protecting the company, diverting resources and annoying investors. Hopkins Manufacturing: The Kansas manufacturer has seen tariffs drive up prices on about 350 items made with steel and aluminum. It is raising prices to compensate. Hudson Pecan: The Georgia pecan grower has shelved plans to triple capacity, build another warehouse, and hire another 20 people because of tariff uncertainty. Hussey Seating Co.: The Maine bleacher manufacturer has seen steel prices rise by 45 per cent during the last year as a result of Trump's tariffs, throwing a monkey wrench into its locked-in contracts. Hyundai: Tariffs will push up production costs at the carmaker's Alabama plant by 10 percent a year. Illinois Tool Works: The company faces higher material costs due to tariffs. Independent Can Company: The Maryland cannery can't afford to pay higher prices for the steel it imports from Germany, and it can't get the steel it needs from domestic producers because U.S. Steel doesn't make steel coils that are big enough to meet its needs, and the quality is not good enough. Its customers have bailed as a result of supply problems. Infinity 8: The California exporter's shipments of cherries to China have fallen from 10,000 cartons last year to 240 this year because of retaliatory tariffs. Last year, it shipped 76,410 cartons of Valencia oranges to Shanghai. This year it has shipped 3,240. Last year it shipped 44,036 cartons of plums to Shanghai. This year it has shipped 170. Insteel Industries: The North Carolina concrete reinforcement maker says its customers are turning to foreign imports to find cheaper prices. James E. Pepper Distillery: The owner of the Kentucky distillery says "the tariffs were like a punch in the gut." Jack Daniels: The Tennessee distiller, which says the trade war is reducing profits, plans price increases to compensate. JAQ Matic Valve & Controls: The Wisconsin small business says tariffs are "severely hurting" profitability. It is passing costs on to customers and may have to lay off employees because it can't support its current work force without an export market. Jim Beam: The bourbon maker is considering price hikes next year as a result of retaliatory tariffs. JLab Audio: The U.S. headphone designer faces higher costs due to tariffs that it will have to absorb or pass on to its customers through price increases. Joann Fabric and Craft Stores: "The resulting tariffs on these targeted products will cause substantial harm to our customers, our employees and the economy as a whole," the chain's CEO says. "Our customers, many of whom are nonprofit organizations and small businesses which operate on tight budgets and retirees who are on fixed incomes, could not tolerate the increased pricing resulting from the tariff costs." Kia: Tariffs will harm the carmaker's U.S. operations and jeopardize plans for additional U.S. investments. Kimberly-Clark: Faces $200 million of higher input costs because of tariffs, the paper-products company is raising prices to compensate. Bernie Kosar: The Ohio farmer says he may not turn a profit on his crops due to China's retaliatory tariffs. Laitram: The Louisiana conveyer belt manufacturer has been put at competitive disadvantage with its foreign peers because tariffs have increased its steel prices by 12 percent to 14 percent. It is downshifting and delaying investments, falling behind its competitors, and hurting its suppliers and their suppliers. Lakeside Manufacturing: The Wisconsin medical equipment manufacturer, which has been in business for a quarter of a century, has never seen price increases like those caused by Trump's tariffs. Lennox International: The air conditioner maker, which forecasts $5 million in costs in 2018 from tariffs, is raising prices to offset the expenses. Lilitab: The California company, which makes iPad stands and kiosks, reports that a supplier raised prices for aluminum sign materials in anticipation of tariffs. Lincoln Electric: The welding equipment and supplies maker is raising prices on so-called consumables via surcharges to offset the costs of tariffs. Lippert Components: The Indiana RV and boat part maker has begun importing some additional components made from steel and aluminum and is considering importing more because there are cheaper alternatives overseas. Little Bay Lobster Co.: The New Hampshire company had a big market in China that has dried up because of retaliatory tariffs. It doesn't know how long it can pay its 75 employees, who aren't working. Louroe Electronics: The California company, which makes electric capacitors, has no choice but to pass tariff costs on to its customers, which may reduce its sales. Lucerne International: The Michigan auto supply producer says tariffs threaten the life of the company, the livelihood of its employees, and an intricate auto supply chain that creates hundreds of thousands of U.S. jobs. M&B Metal Products Co.: The company may abandon plans to upgrade its factory near Birmingham, Alabama, which fashions steel wire into clothing hangers sold to dry cleaners and uniform-rental firms, because of tariff costs. M2S Bikes: The North Carolina electric-bike startup can't find comparable materials in the U.S. Tariffs add $435 to the cost of its bikes. As a result, expansion plans are on hold. MAHLE: The piston manufacturer faces about $1.7 million in increased costs from aluminum tariffs, along with tariff-induced costs for other Chinese products. It is passing costs along to its customers. Martin's Steel: The Pennsylvania steel manufacturer, which has seen the cost of aluminum rise by 45 percent and steel by 30 percent, has had to increase prices, hurting its customers. Maschhoff Family Foods: The Illinois pork producer stands to lose $100 million annually as a result of tariffs. 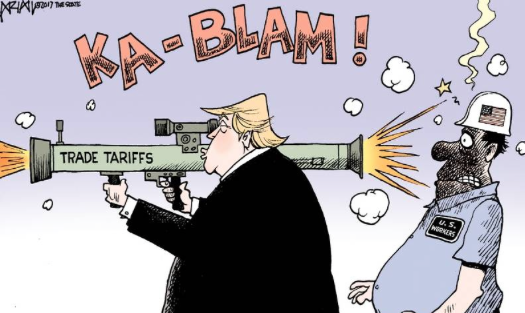 McClatchy Newspapers: The company, which publishes of the Miami Herald, The Kansas City Star, and more than two dozen other regional papers, laid off about 140 people, partly as a result of Trump's tariffs on Canadian newsprint. Merritt Aluminum Products Co.: The Colorado manufacturer is spending more time dealing with late deliveries, quality issues, and other supply-chain problems as aluminum producers grapple with increased demand. Ryan Mickelson: "The farm economy is not good right now at all," the Iowa farmer says, "and if something doesn't change, there is going to be a lot of farmers going bankrupt. Something has to change, and something's got to change fast. Trump promised and said nothing is going to happen to us farmers, but since this came out and tariffs took effect we've seen nothing but a dive in the markets." Micro: The New Jersey medical device manufacturer is facing a 30 percent loss of market share because of Trump's trade actions. That would effectively stop the company from expanding its operations in the foreseeable future. Mid-Continental Nail: Missouri nail manufacturer has laid off 60 of its 500 workers because of increased steel costs from tariffs. The company is in danger of shutting down altogether because tariffs eliminate its profit margin. Millenia Products Group: The Illinois fabricator has had customers move production to Europe and Canada because of tariff-induced price increase for raw materials. It says the market has not been this difficult in 50 years. MillerCoors: The brewer faces a $40 million profit hit due to aluminum tariffs. Mirror Metals: The California company, which makes finishes for architectural metals, says tariffs have cost it $1.2 million so far. It has passed these costs on to customers. Mississippi River Distilling Co.: The Iowa distiller is worried that the impact of tariffs will affect its bottom line. MJM Yachts: The Rhode Island yacht maker lost a $2.2 million yacht sale, representing more than 8,000 man-hours, to a Monaco buyer because of retaliatory tariffs. The income from that one boat would support four families for a year. The company has abandoned plans to expand sales in Europe. Moog: The musical instrument maker may cut jobs or move operations out of the country because tariffs will make it too expensive to do business in the U.S.
Moonlight Meadery: Retaliatory tariffs killed a deal that would have doubled the New Hampshire winery's output. The company, which also has been hit by the tariff-induced increase in aluminum costs, has been forced to lay off five employees. Multi Parts: The Florida parts supplier has seen its flow of orders slow, and tariff-induced increases in prices for materials have caused it to stop hiring new workers. Jimmie Musick: The Oklahoma farmer projects "a wave of farm closures" by next spring because of tariff disruptions. Nashville Wire Products: The Tennessee manufacturer depends on competitively priced steel to fabricate products and compete in a global marketplace. But tariff-induced steel price spikes have forced it to raise prices, hurting consumers and leading its customers to switch to cheaper foreign competitors. If it cannot retain its customers, it will have to lay off employees. Nebia: The San Francisco manufacturer is considering shifting manufacturing of its $399 spa-like shower heads to Mexico from Minnesota because of tariffs. Aluminum accounts for 40 percent of its costs. Newell Brands: The company, which owns the Rubbermaid, Crock-Pot, Sunbeam, and Graco brands, says Trump's tariffs will cost it $100 million a year. Niemeyer Farms: "I hate to see these roller-coasters," the owner of the Illinois farm says, "because it makes it so difficult to price your grain and anticipate what's going to happen in some negotiation you have no input into whatsoever. I hope cooler heads prevail and they negotiate some of these differences out." North Mississippi Grain Company: "Here in Mississippi in terms of soybeans, we are extremely dependent on exports," says the export company's owner, who is also a farmer. "And China is by far the biggest importer of soybeans in the world. I believe in free trade, especially in terms of agriculture. Mississippi farmers are the ones being hit the hardest. We need to resolve this issue." O'Reilly Automotive: The Missouri-based auto parts chain has passed along part of tariff costs to consumers through price increases. Offshore Energy Services: "The tariffs are just tearing us apart," says the Lousiana company's operations manager, "and it is making the operators and everybody pay more." Oneonta Starr Ranch Growers: Some farmers are considering not harvesting crops because of Chinese retaliatory tariffs. Onward Manufacturing Co: The Tennessee manufacturer depends on competitively priced steel to fabricate products and compete in a global marketplace. Tariff-induced steel price spikes have forced it to raise prices, hurting consumers and leading its customers to switch to cheaper foreign competitors. If it cannot retain its customers, it will have to lay off employees. Harold Parker: "Everybody's a little jittery," the Indiana farmer says. "You set your goals. And when you have to back down from your goals, it's always tough"
Michael Petefish: The Minnesota soybean farmer has lost $250,000 of value on his family farm due to China's retaliatory tariffs. Pensmore Reinforcement Technologies: The Michigan company can't find the quantity and quality of steel it needs in the U.S.
Pentaflex: The Ohio truck parts manufacturer is worried about losing customers if it is forced to raise prices. Steel accounts for 60 percent of its product costs. Philips: The electronics company is raising prices on products such as hair clippers imported from China due to tariff costs. Pioneer Service: The Illiniois company lost two orders, worth about $60,000 annually, from a longtime customer because it was forced to double the price of some refrigeration and climate-control parts to account for tariff costs. In response, the customer asked a Chinese competitor to supply the parts. Pittsburgh Post-Gazette: The paper was forced to cut its print edition from seven days a week to five due to newsprint costs. Plains All American Pipeline: The Houston company faces an additional $40 million in construction costs for a pipeline in the largest North American oil field because of U.S. tariffs. Plaza Construction: The company's president says many of his subcontractors are not locking in pricing for more than 60 to 90 days because of tariffs, which could lead to a rise in costs. Polaris: The company, which makes boats, snowmobiles, motorcycles, and recreational vehicles, is raising prices to contend with $40 million in tariff-related costs. Port of Tampa Bay: The port is facing lower shipments due to tariffs. Steel tonnage going through the port is down about 10 percent. PPG Industries: The Pittsburgh company, which supplies paints, coatings, and specialty materials, has seen higher costs for raw materials, especially for tinplate used in paint cans. Prebena: The fastener manufacturer, which relies on German steel, has been forced to shelve growth plans because of tariff uncertainty. Principal Manufacturing: The Illinois manufacturer has seen significant price increases due to tariffs. Procter & Gamble: The company says tariffs have had a "meaningful" impact on a handful of products in Canada. Puma Steel: The Wyoming supplier of structural steel can guarantee prices for only a week or two because of tariffs' impact on the steel market. Qualtek Manufacturing: The Colorado precision metal parts maker is considering scrapping plans to hire 14 employees because tariff-induced steel and aluminum price hikes have increased the cost of company's key products by $300,000. Its customers may divert business to foreign rivals with access to cheaper steel. Rad Power Bikes: The Seattle company was forced to increase prices on its electric bicycles manufactured in China because of tariff costs. Walter Radicioni: The New Hampshire roofer faced four price hikes totaling $400 during the last three months for 1,000-foot rolls of metal coils. The price he charged to do work this summer was locked in early in the spring, before the cost of steel began to rise. Now he has to eat the cost. REC Silicon: The polysilicon manufacturer laid off 100 employees—40 percent of its work force—after being forced to dramatically reduce production because of tariff costs. Regal Marine Industries: The Florida boat maker has seen E.U. orders fall by 90 percent since tariffs were implemented, amounting to millions of dollars in cancellations and delays. Expansion plans have been put on hold. Reinecker Ag: "If China turns to another supplier, it will cause an over-supply of pork domestically, driving prices downward," says an owner of the Pennsylvania pig farm. "Their people still eat three meals a day. They're still going to need meals. They're going to go to another supplier." RelianceCM: The Oregon electronics manufacturer has lost two customers to Chinese competitors because of tariff-related costs in the U.S., a significant blow to 30-person company. "We have fought and worked so hard to find a niche where we can compete," the company's owner says. "This has the potential to pull the carpet out." Richard & Rice Construction: The Florida construction business has seen a 10.5 percent increase in lumber costs thanks to Trump's tariffs on Canadian lumber. The cost of rebar has shot up by 58 percent. Ridgetop Orchards: "The U.S. apple industry does depend on exports," says a co-owner of the Pennsylvania farm. "Without certainty in foreign markets, why would you invest in equipment, why would you invest in anything? The stakes are high. People will lose their jobs." Anthony Rinald: "The margin of profit is low, real low," the Pennsylvania farmer says. "It's borderline if we're going to make it or not." Sadie's: The New Mexico salsa company worries it might have to raise prices because of tariff costs. Sam Adams: The brewer is raising prices to offset tariff costs. Kevin Scott: The South Dakota farmer says tariffs are "messing up" his market and generating "a lot of heartburn in farm country." Retaliatory tariffs are having a negative effect on farm prices. Seneca Foods: The New York food processor needs steel from China to make fruit and vegetable cans because the domestic supply is insufficient and of lower quality. Tim Servais: The Wisconsin dairy farmer is worried about how the industry will plan for the future. "Do we pursue this market [in Mexico]?" he asks. "Because we don't even know if we're going to be dealing with this country down the road. And we have this big market lined up right here, but it might all fall through because of the trade situation." Rusty Smith: Noting that farmers "live and die by trade," the Arkansas farmer reports that the tariff-induced decrease in soy prices has translated into a nearly $100-per-acre loss in crop value. "That's $100,000 that has disappeared into thin air," he says. Smokey Mountain Trailers: The Tennessee business has been hit with "materials surcharges" of as much as 7 percent on the trailers it sells. It is passing these costs along to consumers. Snow Joe: The New Jersey snowmobile manufacturer may halt a major expansion that would add 100 workers because of tariff-induced costs. Sonoco: The South Carolina company, which produces packaging material, projects as much as $9 million in tariff costs in the second half of the year. It plans price hike on some products. Staber Industries: The Ohio washing machine and drying cabinet manufacturer has seen costs for aluminum more than double because of tariffs. Domestic aluminum producers don't make what it needs. Scott Stahl: The South Dakota farmer says farmers aren't interested in getting a check from the government to offset their tariff-induced losses. They want markets instead. Stanley Black & Decker: The tool and hardware company, which faces $35 million in tariff-related costs, plans price increases to offset them. It is considering replacing American suppliers with foreign ones for components of products made in the U.S.
Steelcase: The office furniture manufacturer was forced to increase prices for a second time in four months, partly due to tariffs. Ben Steffen: The Nebraska farmer says tariffs have hit his pocketbook from several angles. Stephens Precision: The Vermont toolmaker is facing increases of 15 percent to 20 percent in prices for steel materials because of tariffs, meaning additional annual costs in the six figures, which will have a big impact on operating margins. "It decreases my profit margins while making it harder to compete with China, Taiwan and other low-cost countries," the company's general manager says. "A lot of time, we can't raise our prices because that will just make our customers look elsewhere. We could potentially lose a job if we fluctuate our prices." To compensate, the company has put planned wage increases and expansion on hold. Steve Madden: The footwear and accessory company is raising handbag prices and considering shifting production to Cambodia from China because of tariff costs. Stinson Steel: The Tennessee manufacturer depends on competitively priced steel to fabricate products and compete in a global marketplace. Tariff-induced steel price spikes have forced it to raise prices, hurting consumers and leading its customers to switch to cheaper foreign competitors. If it cannot retain its customers, it will have to lay off employees. Stockmeier Urethanes: The West Virginia manufacturer does business all over the world but doesn't have adequate domestic suppliers, which is raising costs. Storm Lake Times: The Pulitzer-winning Iowa newspaper has seen printing bills rise by about 13 percent because of Trump's tariffs, forcing it to trim the size of its TV magazine, cut back on color printing, and consolidate sections. Strato: The New Jersey railroad car part manufacturer cannot get the parts it needs domestically. Stripmatic Products: The Ohio metal parts maker scrapped plans to hire new workers and may have to lay off current employees and reduce bonuses because of tariff-induced increases in steel costs. Its customers may seek a cheaper, non-American alternative. SunPower: The California solar energy company faces more than $50 million in cost increases in the second half of 2018 because of a 30 percent U.S. tariff on solar panels. That is more than its entire R&D budget. As a result, SunPower is considering cutting jobs and exiting some businesses. SunRidge Dairy: The Idaho family dairy, which has 2,900 cows, saw a 15 percent drop in milk prices, causing a monthly $150,000 loss, because of tariffs. Superior Grain Equipment: The North Dakota company has been negatively affected by tariff-induced steel price increases. Tampa Bay Times: The Pulitzer-winning Florida newspaper has cut 50 employees to compensate for a $3 million increase in newsprint costs caused by Trump's tariffs. Tennsco: Steel comprises more than half of input costs for some of this Tennessee manufacturer's products. It is raising prices to cover costs because its margins aren't big enough to absorb the increases. Terex Corporation: The Connecticut raw steel purchaser expects to lose market share and profits. It may be forced to reduce its work force. The Grasshopper Company: The Kansas mower company, which is seeing significant cost increases as a result of tariffs, is raising prices to compensate. The Jackson County Times-Journal: The historic Ohio paper, which has been published since 1847, went out of business, partly because of tariffs on newsprint. The Lobster Co.: The Maine company has put expansion plans on hold because of China's retaliatory tariffs and may go out of business. Chinese customers can get Canadian lobster at a fraction of the price. The Metalworking Group: The Ohio manufacturer had to expend about 1,000 hours on repricing and renegotiating contracts because it could no longer honor its old prices. The company also had to delay plans to spend some $500,000 on equipment and hire more employees because prices were so uncertain due to tariffs. Jimmy Tosh: "It's very concerning," the Tennessee farmer says. "We going to have to hire 25 to 30 new people to help run the operation, and we have put that on hold." Toyota: The carmaker, which faces nearly $100 million in tariff-related cost increases per year, may stop importing some vehicles into the U.S. because of proposed U.S. tariffs. Trans-Matic: The Michigan-based auto parts manufacturer has had to raise prices because of the increased cost of steel, leaving it with fewer orders to fill, which has led the company to cut its employees' hours. "When you cut them back…they get grumpy," says Trans-Matic's CFO. "This is all causing a bit of chaos." Trent Thiele: "We usually try to expand a little bit every year just so we aren't going backward," the Iowa farmer says. "We did not expand any at all this year due to where we're at, with the uncertainty." TriPork Farms: The Illinois farm worries that pork exports to China will dwindle to almost zero because of tariffs. Trophy Brewing: The North Carolina brewer has seen its can cost rise by about a penny, or $40 per pallet, due to tariffs. Truform: The Tennessee manufacturer depends on competitively priced steel to fabricate products and compete in a global marketplace. Tariff-induced steel price spikes have forced it to raise prices, hurting consumers and leading its customers to switch to cheaper foreign competitors. If it cannot retain its customers, it will have to lay off employees. Tusco Display: The Ohio custom store fixtures maker laid off 20 contract workers, furloughed 10 employees, and put off plans to spend $1 million on a new system for washing, drying, powder coating, and curing metal products because of tariffs. Tyson Foods: The Arkansas company faces roughly 25 percent lower profits in 2018 because of tariffs' negative effect on domestic and export food prices, mainly for chicken and pork. United Technologies: The company, which owns Pratt & Whitney, Carrier, and Otis, says tariffs are reducing its earnings. It is looking at cost-cutting measures to compensate. Vans: The footwear company is facing increases in the cost of belts and other accessories due to tariffs. Dee Vaughan: The Texas farmer says shipping companies are hesitant to buy his crop because of tariff uncertainties. Vaughn Manufacturing: The Tennessee company planned to add five or six new machinists in $28-an-hour jobs. Because of tariff costs, jobs may be cut instead. Virginia Beer Company: The brewer says can costs have gone up significantly because of tariffs. Volvo: The carmaker is raising prices to offset the costs of the trade war. WeFARM Organics: The California food importer/exporter has essentially been shut down by tariffs, which affects at least 100 people. Wesley Spurlock: Tariffs have reduced the Texas farmer's corn, soy, and cotton prices. Wetmore Tire & Auto: The Michigan business plans to pass along to customers any price increases on the low-end tires and brakes it imports from China. Whirlpool: The appliance maker faces $100 million in raw material cost increases due to tariffs. Will Hutchinson: "I'm not sure the people in Washington have a full understanding of what their decisions are doing to us," the Tennessee farmer says. "We need them to come to terms and think about how this is affecting people in the homeland. We will lose more farmers because of this." Winnebago: The RV manufacturer is raising prices to compensate for tariff-related cost increases. Wyoming Machine: The Minnesota contract manufacturer has seen tariffs cause steel and aluminum markets to fluctuate wildly, disrupting the stable prices on which customers depend.